A glowing edge lit acrylic Pitbull Terrier light. Pitbull Terrier 3D Night Light. It is perfect for a desk decoration and also great as gift. How does it work?. It is made of Acrylic Glass. Acrylic Glass or Perspex have similar light transmitting properties like the fiber optics. Automatically color changing mode. Press the touch button to last color, then press it again, auto color changing mode works. Press it thirdly, another color light up. Energe saving. Power spend: 0.012kw.h/24 hours; LED life span: 10000hours. A glowing edge lit acrylic French Bulldog light. French Bulldog 3D Night Light. It is perfect for a desk decoration and also great as gift. How does it work?. It is made of Acrylic Glass. Acrylic Glass or Perspex have similar light transmitting properties like the fiber optics. A glowing edge lit acrylic Robot light. Robot 3D Night Light. It is perfect for a desk decoration and also great as gift. How does it work?. It is made of Acrylic Glass. Acrylic Glass or Perspex have similar light transmitting properties like the fiber optics. A glowing edge lit acrylic Unicorn light. Unicorn 3D Night Light. It is perfect for a desk decoration and also great as gift. How does it work?. It is made of Acrylic Glass. Acrylic Glass or Perspex have similar light transmitting properties like the fiber optics. A glowing edge lit acrylic Dachshund light. Dachshund 3D Night Light. It is perfect for a desk decoration and also great as gift. How does it work?. It is made of Acrylic Glass. Acrylic Glass or Perspex have similar light transmitting properties like the fiber optics. Switch Mode: Rotating Switch. LED color: warm white. It is USB line connect computer or USB adapter. LED Life: 10,000 Hours. Wool board size: 19x19x3cm/7.48x7.48x1.18in. Wood Board x1. Product Weight: 0.55KG. A glowing edge lit acrylic The Dandelion light. It is perfect for a desk decoration and also great as gift. The Dandelion 3D Light. How does it work?. It is made of Acrylic Glass. Acrylic Glass or Perspex have similar light transmitting properties like the fiber optics. A glowing edge lit acrylic Schnauzer light. Schnauzer 3D Night Light. It is perfect for a desk decoration and also great as gift. How does it work?. It is made of Acrylic Glass. Acrylic Glass or Perspex have similar light transmitting properties like the fiber optics. It is perfect for a desk decoration and also great as gift. Fire Truck 3D Night Light. A glowing edge lit acrylic Fire Truck light. How does it work?. It is made of Acrylic Glass. Acrylic Glass or Perspex have similar light transmitting properties like the fiber optics. A glowing edge lit acrylic Pit Bull Terrier light. It is perfect for a desk decoration and also great as gift. Pit Bull Terrier 3D Night Light. How does it work?. It is made of Acrylic Glass. Acrylic Glass or Perspex have similar light transmitting properties like the fiber optics. Low consumption high brightness. Color : colour:black. Material : material：glass；. Due to the light and screen difference, the item's color may be slightly different from the pictures. When we first saw the Bulbing Light we couldn't believe our eyes. Made combing man-made fibres with natural materials, Bulbing is a light like no other. It sits upon a wooden base creating a stylish and elegant lamp. How to use?. Put the acrylic panel into the base -- connect the USB cable. Built-in 3 multiple modes Light Design: Put the acrylic panel into the base -- connect the USB cable -- touch the power button -- Led lamp lighting Light use: 1st Touch will power on light Special effects mode 2nd Touch will power on light Breathing light mode. Shape: Mickey Mouse. Light Direction: Adjustable. Color Temperature: 180 °F. can fixed one color or 7 color gradual changing. Energy saving. Power spend: 0.012kW.H/24 hours; LED Life Span: 10000hours. This unique and charming LED 3D visual night light will be a excellent and romantic gift for your friend and yourself. 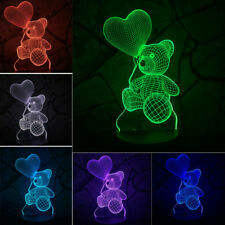 Item Type: 3D LED Night Light. Unbelievable, only use a 2D acrylic piece to create a attractive 3D stereoscopic visual pattern and lighting effects, seems vivid and full of personality, good illumination effect and full of creativity. 3D Wolf LED Night Light 7 Color Touch Switch Table Desk Lamp USB Power Boy Gift. 3D stereoscopic illumination, show you colorful lighting effect. Matching with acrylic light guide plate, bring you soft but bright enough illumination effect, no dazzling and high temperature exists, safe to use. Trending at $11.27eBay determines this price through a machine learned model of the product's sale prices within the last 90 days. Colorful Touch 3d Lamp Illusion Led Night Light USB Table Lamp for Children Baby Kids Gift Bedside Bedroom Tractor. 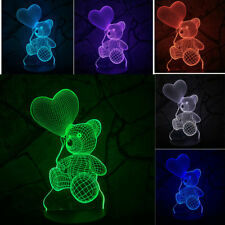 there are 7 colors Touch Night Light 3D Lamp Introduction. 1 x Touch Led Night Light 3d Lamp. Acrylic top pieces Light passes through acrylic glass，3D Illusion Plate Only 4mm thick. Pattern: Mario. 7 Colors change: Red, Green, Blue, Yellow, Cyan, Pink, White. Your mood your colour. 1x 3D Acrylic illusion Lamp.